One of the most difficult things for a writer to do is to choose a book cover. 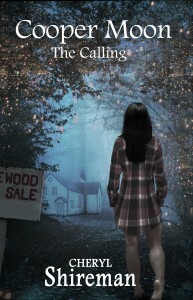 A cover needs to capture the attention of a reader and convey the message and “feel” of a book. A writer spends months (sometimes years!) creating a novel and then has to convey all of those words in a single image. It is never an easy task. I loved the first cover of my Cooper Moon series. Created by the fabulous Paul Beeley of Create Imaginations, it depicted one of my favorite scenes from the novel. Cooper’s wife, Sally, wakes in the middle of the night and goes outside into the woods. It has just rained and the sky is full of fireflies. As she walks through the woods, surrounded by thousands of fireflies, she spots, for the first time, the little church Cooper is building. I think Paul did a great job of recreating that scene. As much as I loved that cover, as my four-book Cooper Moon series began to take shape, I realized I needed covers that would be unique and quickly recognized. I wanted all of the covers to have the same look and feel. I wanted readers to recognize, at a glance, my Cooper Moon novels. I knew this meant that I would need to create some sort of image that would be carried through all four novels. I spent days looking at book covers on Amazon and came up with several ideas that I quickly discarded. I was beginning to lose hope of coming up with anything that felt “right” for the series. Then, one night, just as I was about to fall asleep, it came to me. At one point in the first novel Cooper leaves a note for his wife. Suddenly, I saw this note on all four covers and I had exactly the image that I needed! Although I think the original cover was more attractive, I love these new covers. I think they capture the feeling of the books – especially when you see all four books together! So – stay tuned!! !